I was reminded a couple of days ago of one of my favourite children's projects during the Perth International Arts Festival a few years back. Haircuts By Children involved children between the ages of 8 and 12. Children were trained by professional hairstylists and then paid to run a real hair salon, offering members of the public free haircuts. What I love about this project, as with all the projects by Mammalian Diving Reflex, is that we are challenged to consider children as creative and competent individuals whose aesthetic choices can be trusted. Mammalian Diving Reflex state the project also "shift(s) the traditional power dynamic between children and adults, creating a safe social space where children and adults who live in the same community can meet and share a unique creative experience together. The idea that kids should be allowed to cut our hair evokes the same leap of faith, courage and understanding required to grant children deeper citizenship rights. For many it is actually less terrifying to contemplate allowing kids to vote." Why was I reminded of this project? 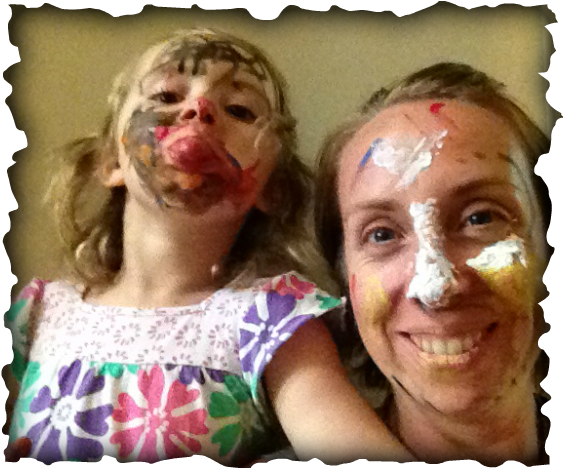 Well my nearly three year old wanted to paint our faces and wanted to do it ALL herself. We've done face painting lots of times before, but I've been in control. This evening, I relinquished all control and it was challenging. I lost count of the number of times I curbed my desire to suggest she not mix the colours, or had used enough of one colour, should perhaps look in the mirror (which I had provided but was largely unused), or perhaps might like to stop putting all of the paint on her chin. It was even more challenging when it was my turn. The challenge, however was worth it. Sure, in my opinion we looked nothing like the leopards she set out to create, but the joy and pride in her face when she declared she had finished, was priceless. She had the autonomy to make all the decisions about what she wanted to create and so the end result was just what it should be. And, we have repeated the exercise since then and she has 'refined' her process, learning by her own experience what she needs to do to get the effect she wants. But how rare are these opportunities for children? Where we trust them, truly trust them to create or make something that they desire, without placing our own pre-conceived ideas of what things should be like on them. And taken one step further, how often do we attempt to give children those deeper citizen rights of being involved in plans and decisions that affect their lives? I suggest that it's not nearly often enough, and if we want future adults that are confident in their abilities and make sound decisions, perhaps it is something we need to do a little more often. Mammalian Diving Reflex do some amazing creative projects with children and young people.